California’s Arts in Corrections program is a model recognized across the globe for its approach to strengthening rehabilitation through arts and culture. We’re currently seeking program development project proposals to help maintain our state’s forward-thinking momentum and grow the potential for the field of prison arts in California. 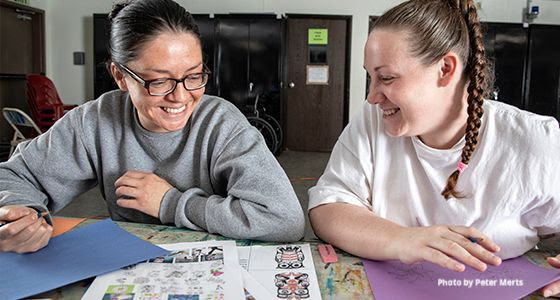 Has your organization been interested in getting involved with our Arts in Corrections program, but doesn't yet have a fully developed program or curriculum? This funding opportunity is for you! Administered by the California Arts Council and made possible via an interagency agreement with the California Department of Corrections and Rehabilitation (CDCR), California’s Arts in Corrections program is designed to have a positive impact on the behavior and attitudes of people in incarceration. Arts education can increase critical thinking skills, build positive relationships and promote meaningful interactions between participants and their peers, facility staff, loved ones, and other individuals and community groups both inside and outside of the boundaries of their institution. Services provided span the full spectrum of art disciplines, with organizations offering instruction in visual, performing, literary, traditional and cultural arts. Now in its sixth year, arts programming has grown to reach all 35 state adult correctional institutions. Learn more at www.artsincorrections.org. Proposal details are available at www.artsincorrections.org. Deadline: April 22, 2019 – 4 p.m. Questions regarding the proposal process may be submitted through a two-round public inquiry process, due by 9 a.m. PDT on March 27 and April 8. Responses will be posted online at 11 a.m. PDT on March 29 and April 10, respectively. Help spread the word by sharing our recent posts on Facebook and Twitter. The California Arts Council is seeking Arts in Corrections Advisors to consider the opinions and viewpoints of returned citizens who have experienced incarceration. Individuals selected will serve as advisors to panelists reviewing Arts in Corrections proposals received from an RFP and will receive a $200 honorarium per day, in addition to accommodations, meals, and travel expenses covered (if the advisor lives 50 miles outside of Sacramento). Click here to view the Advisor application. Copyright © 2019 California Arts Council, All rights reserved. You are receiving this mail because you have signed up for the California ArtBeat.